When people are trying to lose weight, often times they experience failure with their dieting program. Some people are lucky enough to be born with high metabolic rate that helps them burn off calories efficiently and effectively, so no matter whatever they eat, they wont experience weight gain. Most of us, however are born with medium to slow metabolic rate so we constantly have issues with the weight. In Thai traditional medicine (TTM), the dried Thai "Buk" or "Bok Khao" root powder is believed to discourage overeating because it creates a feeling of fullness because the fiber in it swells when mixed with water. Because stomach contents may stay in the stomach longer, the individual does not feel hungry as often. However, in most of the research studying weight loss, study participants also drank large amounts of water and followed a reduced-calorie diet. 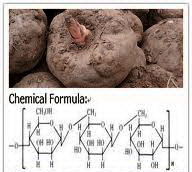 Bok, commonly referred to as Konnyaku in Japan, is a water-soluble dietary fiber that is derived from the native Thai Amorphophallus rivieri root. It is a perennial plant unique to Asia, and more recently cultivated in Japan for noodles and jellies. The fresh Bok Khao(Konnyaku) tuber contains an average of 13% dry matter, of which 70% is glucomannan, and the remaining 30% is starch. 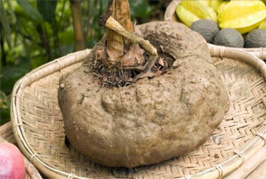 "Konnyaku" is the popularJapanese name for the vegetable fibers derived from the Thai tropical botanical known as 'Buk' or' Bok Khao', Amorphophallus riviera. It doesn't dissolve in water, but forms a thick, gooey gel when exposed to fluids. The body does not digest Bok Khaok, so the resulting large soft mass moves through the intestines and may trigger intestinal muscle contractions. Therefore, is thought to be a mild and effective bulk-type laxative, even though it may take up to 12 hours to be effective. Thai Bok Khao has also been studied globally for treating obesity, diabetes, and high cholesterol. Studies in both adults and children with severe obesity showed varying degrees of weight loss associated either with taking supplements or with replacing some of the usual diet with foods made from (Konnyaku) flourthe dried ground and processed powder made from the raw tuber pictured above right.  Amorphophallus riviera has 18 amino acids equivalent to 6.283%, with the most essential amino acids consisting of 2.634%, and white (processed) konjac contains amino acids of 5.14% and 2.137%. 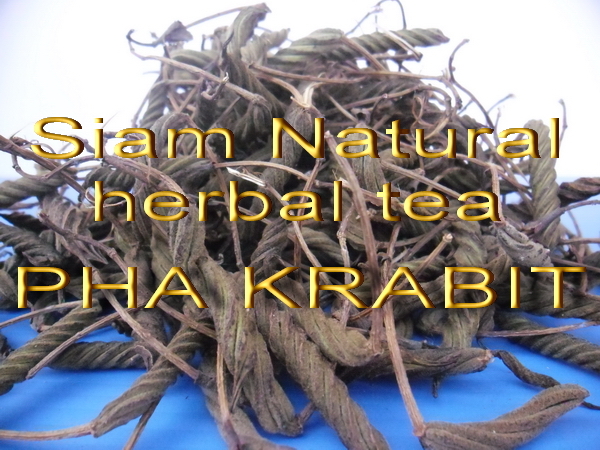 Minerals - Thai Bok Khao root tuber contains a high content of K, Ca, Mg, Fe, Mn, Cu, Co. According to reports by Cuixi, it is necessary for the body to trace elements and constant elements are high in konnyaku. Soluble dietary fiber - Dietary fiber is composed of edible plant ingredients, carbohydrates and other similar substances, which can be absorbed and digested by the intestine. Dietary fiber is absorbed with the assistance of polysaccharides, oligosaccharides, lignin and other plant substances through a process that occurs during fermentation through the intestine. Dietary fiber is a necessary ingredient for one's health. Soluble dietary fiber (SDF) includes mainly pectin and hydrocolloid substances, as ell as hemicelluloses, gum, pectin, algin, bean gum, agar and CMC. Soluble dietary fiber is incredibly adhesive, thus it can form a protective screen in the surface of the intestine. As a result, it can bind together the molecules of cholesterol, which in turn allows konnyaku fiber to be the best soluble dietary fiber; due to its content. Possibly due to the same delay in stomach emptying, Konnyaku may improve blood sugar levels in individuals with diabetes. Because the absorption of carbohydrates from foods is slower when taken, blood sugar levels may not rise as high or as fast as usual. Some preliminary results from animal studies suggest that Konnyaku may increase the sensitivity of body tissues to the insulin that is produced or taken. In several studies, taking Buk powder has also appeared to lower blood levels of total cholesterol, low-density lipoproteins (LDL, or "bad" cholesterol), and triglycerides. Although more research on this possible use of Konnyaku is needed. Konnyaku may also increase the elimination of cholesterol and its components from the body. It may also keep bile acids from being reabsorbed in the intestines, further reducing cholesterol levels in the blood, because the body uses cholesterol to produce more bile. Konnyaku is a polysaccharide consisting of repeating units of beta-D-glucose and beta-D-mannose joined together in a chain. Historically, it has been used in traditional Asian foods such as noodles, tofu, and other food products. Konnyaku flour (made from the tubers) has been a healthy Japanese jelly called "konyaku" for over two centuries. By expanding in the stomach, it's useful for people trying to lose weight. Fiber-containing foods such as Oats are known to help reduce cholesterol, improve bowel functioning and assist in weight reduction by creating a feeling of fullness. However, many people have a hard time consuming enough fiber from food and turn to fiber supplements such as Guar Gum and Pectin to help fulfill their daily requirements and get that feeling of "fullness." Buk (Konnyaku) offers a significant advantage over these other forms of fiber - much smaller doses are necessary to achieve optimum results. When placed in water, it can swell up to seventeen times its original volume. 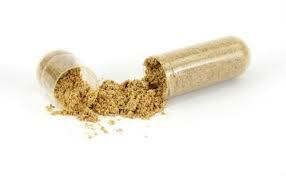 These qualities make it extremely effective and convenient as a dietary fiber supplement. It cannot be digested in the stomach and it is quite healthy. It has comprehensive effects to the human body and can prevent many chronic diseases by regulating the metabolism. Lycerides prevent the absorption through the intestine, so Thai Buk can aid in losing weight, lowering blood pressure, lipids, glucose and cholesterol.  Several small controlled studies have found Bok Khao to be effective for reducing total cholesterol levels in otherwise healthy adults. Konnyaku reduced bad cholesterol (LDL) and, according to some studies, increased good cholesterol (HDL). In addition, it may improve other risk factors for heart disease, such as high triglyceride levels and high blood pressure.  Several studies have suggested that it may also help the body to regulate blood sugar levels and, therefore, could be helpful in treating diabetes. Additionally, Konnyaku might be helpful for individuals who experience episodes of low blood sugar. In one double-blind study, participants showed significant reductions in total cholesterol, LDL cholesterol and triglycerides, as compared to a placebo. In addition, their systolic blood pressure (the upper number in the blood pressure reading) was also reduced. However, there was no significant increase in HDL cholesterol and no improvement in the ratio of LDL to HDL cholesterol in that study.  Another study of individuals with diabetes tested for the effectiveness of Konnyaku fiber-enriched biscuits against wheat bran biscuits for better blood sugar control, and while using the Konnyaku biscuits, people had a significant improvement in glucose control, as opposed to the wheat bran biscuits. Other studies have also found evidence that it can improve blood sugar control. However, while this evidence is promising, more studies need to be performed before Konnyaku can be considered an effective support treatment for diabetes. 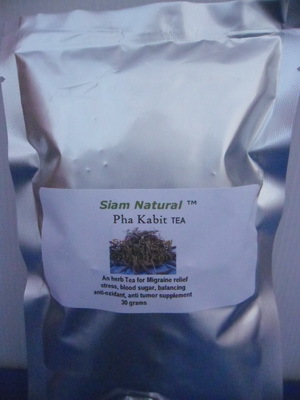 For 100% natural weight-loss Thai BUK fiber V-caps go well with Pha Krabit seed pod holistic tea for natural thyroid balancing!